Maximum Speed Notice: Due to the popularity of high speed aircraft, such as pylon racers and FPV Wing Racing Aircraft, pilots are running much faster set-ups in their models. 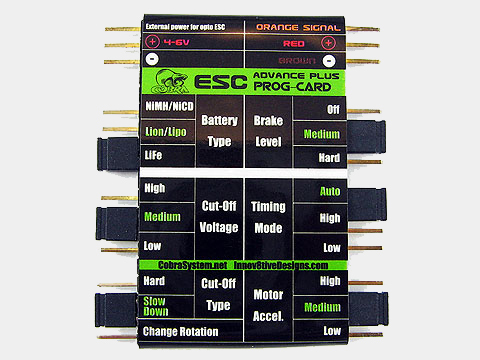 The Cobra DL+ Series Airplane ESC's are capable of running at speeds of up to 180,000 switching cycles per minute. This equates to a maximum speed of about 25,000 RPM when used with most of the Cobra brushless motors, or other brands that use 14 magnets in the flux ring. If you have a set-up that requires prop speeds in excess of 25,000 RPM, you should use one of the newer Cobra Wing Series Speed Controllers.